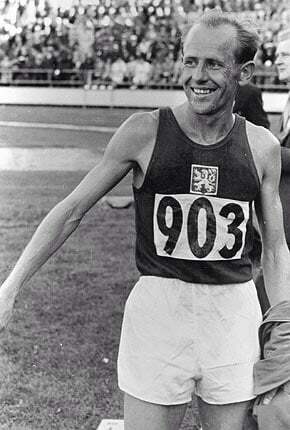 As the 1952 helsinki olympics drew to a close, Czech-oslovakia’s Emil Zatopek, 29, had already won the 5000 meters and 10,000 meters, setting new Olympic records in both. He could have rested on his substantial laurels. Instead, he chose to enter an event he had never run before–the marathon. There he faced England’s tough-as-nails Jim Peters, who had recently lowered the world record from 2:25:39 to 2:20:43. Hoping to shake his unexpected new foe, Peters started at a crazy fast pace, especially given the warm weather. Zatopek followed on his heels. Just before halfway, Zatopek turned to Peters and asked, in perfect, formal English: “Excuse me, but the pace–is it fast enough?” Not to be outdone, Peters answered, “No, too slow,” so Zatopek accelerated. Peters couldn’t keep up and eventually dropped out near the 20-mile mark. By that time Zatopek was alone and well ahead of the field. Before a capacity crowd in the Olympic Stadium, the new marathoner broke the tape in 2:23:03–his third Olympic record in three races at the Helsinki Games. No one before or since has matched his triple-gold performance in the 5000 meters, 10,000 meters, and marathon. So, there’s a good lesson in sportsmanship. Lie to your competitor to force them to run to exhaustion, and they might just sneak up and beat you instead. Also, the whole setup of the underdog asking the front-runner how to run the race, and the snarky answer followed by a backfire … doesn’t it sound like a subplot in one of the Police Academy movies? Be sure to check out the full Runners World list for all of the stories. If nothing else, it might inspire you to head out for a few miles yourself!